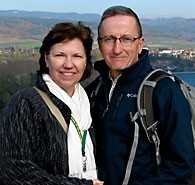 Dennis and Mary Jo Weiss write from their home in Hamburg, New York. Over 30 years ago, as a couple of starry-eyed kids just out of college, they made a promise to love and honor each other “all the days of their lives”. With the blessings of five children and now grandchildren, their journey continues. After four years of blogging, Dennis and Mary Jo present their final blog post for For Your Marriage. As a farewell to readers, they offer some wisdom and advice for living out "happily ever after" in marriage.